Project budget to include 10 percent for unforeseen/changing circumstances upon project completion. 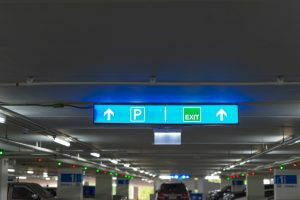 The project manager should complete a final walk- and drive-through in and against the direction of traffic to ensure installed signage is clear and concise, communicates the desired message, and is positioned for maximum visibility. Avoid sign pollution. Time is limited. Customers should be able to find the information they need instantly. Limit the amount of signage while still communicating the message effectively. Ensure there aren’t conflicting pedestrian and vehicular arrows. Directional arrows are amplified when placed in a circle. Consider elevator symbols. The use of elevator symbols has evolved over the years to address diversity of those parking in our facilities. Contrast between background color and messaging. Readable font that makes the message clear at a quick glance. Be consistent in font type, size and color. Remove excessive information. Upper and lower case lettering is preferred to ALL UPPER CASE. Click here for examples of each of the above. John Hammerschlag is president of Hammerschlag & Co., Inc.